Central Asia is the region clearly visible on the map of the world. It covers the area of approximately 4,000,000 square kilometers; its population is about 55 million people. The region is a natural bridge between Europe and the countries of Eastern Asia. At present numerous railway lines and long distance autobahns crossing this territory are in extensive use. Natural resources of Central Asia, hydrocarbon, non-ferrous and rare metals deposits in particular, are so plentiful that China, South Korea, Japan, USA, European Union, Russia, and India are equally interested in their prompt and most efficient exploitation. This fact has already given the region a new and strong stimulus for development, attracted billions of dollars of foreign investments. And this is just a beginning. The nations of Central Asia can benefit from stability and good neighbourly relations, prudent attitude to water as a common natural resource, transparency of borders, and economic integration within the framework of the region. In policy of Central Asian countries these are the priority goals. 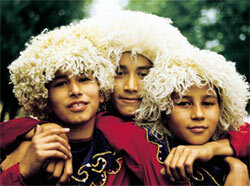 Since 1991 Central Asia is represented by independent countries, which are young but have a great history. Not long ago Central Asia under the name of Turkestan Territory was a part of the Russian empire. Under the Soviet regime the countries of Central Asia managed to survive the so called "social experiment" and to preserve their language, religion, customs and traditions. Nowadays young sovereign countries follow the path of freedom and independence, attracting the world public by their historical monuments and novelty of their affairs. Let's get acquainted with these countries. Uzbekistan, a comparatively small but densely populated lowland country, is located between the two great Asian rivers the Amudarya and Syrdarya. Transoxiana is considered to be the world centre of eastern civilization, where a great number of ancient monuments are located. Tourists from all over the world are invariably attracted by the mosques, madrassahs, and mausoleums in such historical centres as Samarkand, Shakhrisabz, complex of Ichan-Kala in Khiva, which were rightfully included into the UNESCO World Heritage List. 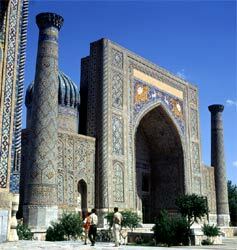 The capital of the country Tashkent is rapidly becoming a modern developed, international mega polis. There have recently appeared skyscrapers made from glass and metal, many-tier overpasses, new parks, hotels and fountains. Of great interest is the city underground - a unique engineering construction built in highly seismic zone. Each of its 29 station dressed out in marble and granite have been beautifully decorated by the country's best artists and designers. The journey to Tashkent can be complemented by a pleasant trip to Charvak water reservoir or to the mountain skiing lodge in the Chimgan Mountains, the favorite recreation centres for the citizens of Tashkent and its guests. Kazakhstan is a big country whose plains seem endless. It occupies the area bigger than the territory of all the rest republics of Central Asia taken together. In the north Kazakhstan stretches as far as the West-Siberian plain, whereas in the south it comes close to the Tien-Shan Mountains. Virtually from the streets of any big city of Kaszakhstan one can see the snow-covered mountain tops. Thus, the Zailiyskoye Alatau towers the country's former capital Almaty. Here, in the mountain tract not far from the city, there is famous Medeo skating rink and mountain skiing lodge. Other tourist attractions are Borovoye resort with its relic pine forests and the primeval beaches on the eastern coast of the Caspian Sea. One of the magnificent monuments of medieval architecture is the mausoleum of Hodji Ahmad Yassavi in the town of Turkistan which was built in Timur's reign. And surely the Baikonur Space Centre, the world-known astronautics launching pad is worth mentioning. 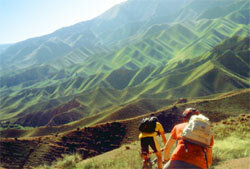 Kyrgyzstan is predominantly a mountainous country, crowned by cloudy mountain ridges of the Tien-Shan and the Alatau. 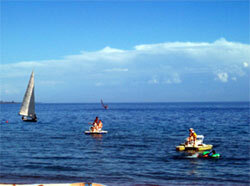 There are more than 2000 lakes in Kyrgyzstan, but mountain lake Issyk-Kul undoubtedly ranks first. Wonderful swimming facilities, the charms of a southern seaside, but without unbearable heat even at the height of the summer, salutary wells and grandeur of the natural landscapes - all this has brought world fame to lake Issyk-Kul. Another jewel of the local nature is lake Sary-Chelek, located at the height of 2000 metres above sea level and surrounded by the thickets of Tien-Shan blue spruce. The nature of the country is really unique: snow-covered mountains, blooming gardens and vineyards, woods of silver fir, evergreen spruce and Tien-Shan fir, thickets of sea-buckthorn and barberry. It is known that warriors of Alexander the Great used to eat with delight the nuts from the forests of Arslonbob whose age is more than 3000 years. Throughout the territory of the republic one can come across the ruins of Zoroastrian, Buddhist and Christian monasteries. And in the ancient city of Osh there is a holy Sulayman-hill with the house of Zakheriddin Bobur, the conqueror of Northern India and the founder of the empire of the Great Moguls. The word Turkmenistan is usually associated with deserts. And indeed, the great part of the country is occupied by the Karakum desert. Yet many towns, centres of civilization, existed here from time immemorial. There have been preserved in particular many ancient and medieval monuments of Parthia and Margiana. Among them the capital of Margiana - ancient Merv, with its imposing ruins rising from the excavation site. UNESCO has included the historical-cultural reserve of "Ancient Merv" into its World Heritage List. The Karakum Canal running its full length of 1500 km from the Amudarya to the Caspian Sea is open for navigation all the year round. Firuza, buried in verdure and located at the spurs of the Kopetdag not far from Ashgabad, enjoys wide popularity among tourists. The capital itself has turned into a modern city with European level of comfort. 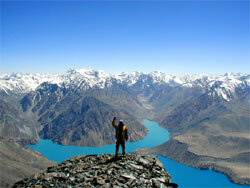 Tajikistan is undoubtedly linked with the Pamirs, Roof of the World. Ninety-three per cent of its territory is covered with mountains whose peaks exceed 7,000 metres. And that is why the Pamirs is the centre of world's mountaineering. The valleys are particularly beautiful in summer, when they are covered with floral carpet created by wild irises, poppies and edelweisses. Mountain slopes are green with bushes of firs, laurel and juniper. Foothills are the real paradise for speleologists. More than 200 caves have been inspected by now and many others still remain unexplored. Tourists can be amazed by colorful lakes in the mountain gorges, including Sarez Lake, formed by a gigantic avalanche, Kayrakum and Nurek reservoirs with their enchanting beaches. No less popular among the citizens and the guests of this mountainous country is the Obi-Garm resort famous for its healing mineral springs. Tourists won't fail to visit such ancient cities as Khodjent, founded by Alexander the Great himself, and Penjikent with its monuments of Sogdian period, the fortress of Hissar, Mausoleum of Hodja Mashhad, and ancient settlement of Ajina-Tepe with the remains of Buddhist monastery. Today Central Asia is a fast changing and developing region. The Independence, which countries of Central Asia obtained in 1991, begins to give its benefits. Each of these countries has its own features, its own peculiarities in internal structure and in international relations. World community is helping Central Asian countries to enter marketing economy, to find their place in the world markets. The revival of the Great Silk Road contributes much to this purpose. As a matter of fact the Great Silk Road in its modern perception opens the Central Asian countries the whole world and at the same time becomes a guarantor of their sovereignty.